A powerful PC at a premium price. The R8 is packed with high-end performance parts and has one of the best toolless access cases on the market, but it's still hard to justify this massive price tag. Dimensions: W: 8.34" H: 18.60" L: 14.10"
The battle for the mantle of best gaming PC has becoming increasingly heated over the last few years, not only as a result of a number of new competitors entering the field, but also because all this heated opposition has caused a net increase in quality and diversity across even the most staid, long-standing brands. The introduction of some fascinating new technology, as well as improvements and innovations in areas traditionally considered more peripheral like case design or cable management, mean that there's never been a better time to be shopping for a prebuilt PC. Alienware has continued to shift its focus in the wake of being acquired by Dell way back in 2006. These days it prioritizes high quality builds centered on user-facing conveniences over flashy design features aimed at a misapprehension of gaming enthusiast culture. Modern Alienware prebuilts focus on highly customizable builds, the latest performance components, and easy access and upgradeability, all the things PC gamers actually cherish most. Unfortunately, the one part of their less palatable heritage they haven't shed is a significant markup on their machines, and both of these legacies, positive and negative, are evident in the Aurora R8. Eschewing the tempered glass side panel that's becoming ubiquitous in gaming PC designs (intended to showcase a growing number of RGB lit components and peripherals), the Aurora R8 opts for an opaque case with a few tasteful lines of RGB lighting and a glowing Alienware logo on its otherwise gunmetal grey exterior. The lines of the case are a combination of bold angles that present a futuristic aesthetic, perched on some similarly angular feet. I like the relief from the endless rectangular boxes that are the norm for the best PC cases, though the plastic make of the side panels feels a bit cheap and I wonder if a more traditional form factor would've left the interior of the case less crowded. 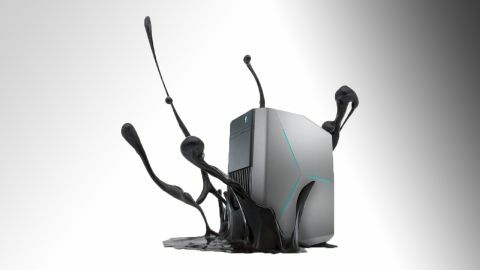 Bizarrely, though Alienware is marketing the Aurora R8 as 'whisper quiet,' there were times under serious load when it sounded like a vacuum cleaner, with every fan blowing simultaneously and the whole unit giving the impression it was preparing for lift-off. These instances were blessedly few and far between, but calling the Aurora a quiet machine is stretching (maybe even tearing) the truth. That said, accessing the Aurora's internals is incredibly easy and can be done wholly sans tools. The side panels pop off easily, and the entire PSU can be swung out from the interior on an arm that exposes the GPU, DIMMs, and the rest of the components. There's something very pleasant and satisfying about pushing a couple of switches on the rear of the machine and swinging the PSU out on a mechanical arm, and it makes the process of upgrading the memory, changing components, or swapping out/adding GPUs a breeze. Which is great, because the Aurora provides plenty of overhead for expansion. Not only is there another full PCIe lane if you want to SLI in a second video card, but the Z370 mobo sports four DIMMs (for up to 64GB of DDR) and supports up to five storage drives plus an optical disk drive. Our review unit came with a 512GB M.2 SSD and a 2TB HDD and no ODD, but it was easy enough to pop in additional drives I had on hand to sate modern games' capacious hunger for more storage. The machine is also festooned with a welcome number of ports, including three USB Type-As and a USB Type-C on the front and a very generous 9 USB Type-As littering the back. The Aurora performs about as you'd expect from a machine packing an i7-9700K and an RTX 2080. The slightly more robust processor means it marginally outperforms 2080 competitors equipped with the more common i7-8700 and just about on par with Ryzen 7 2700X, 2080 builds. Even against the 8700 machines, the difference is pretty slender—it bests HP's Omen Obelisk and Corsair Vengeance 5180 by a scant few frames per second in the Shadow of the Tomb Raider and Total War: Warhammer II benchmarks. As you would imagine, the real advantage is in productivity, where the Aurora R8 takes a clear lead over the Obelisk and Vengeance in both single and multi-core performance. The results are bit more uneven when pitted against the Ryzen 7 in Origin's Neuron machine, where the R8 leads in single core performance but falls behind in multicore. As with most 2080 machines, the Aurora is a steady performer at 4K Ultra, yielding a pretty consistent 30 FPS in the majority of the games we tested (other than outliers like Metro Exodus on Extreme, one of the most demanding games currently available, in which FPS dipped closer to the 20 mark). To get up to or past the 60 FPS mark, 1440p is your best bet—the Aurora crushes 1440p Ultra to the tune of 60+ FPS in most titles, and managed a very solid 43.33 FPS even in Metro Exodus on Extreme with ray tracing enabled. The only major flaw hamstringing the Aurora is its price point. While much humbler models are available starting at the $799 mark, all the models I looked at, including our review unit, suffered from a substantial markup over the price of building a similar rig yourself. Putting together a rig similar to the review machine at PC Part Picker I arrived at a price point near $2,400, a full $377 less than the Aurora's $2,777 MSRP. It's a shame because I really like the Aurora, but it's hard to recommend with a nearly $400 markup. However, if you like the proprietary case (as well as the warranty and other benefits of buying prebuilt) and have the money to spare, the Aurora is a great way to step up to the world of 4K gaming.